A few months ago, we asked Empowering Parents readers to share how they respond when their child acts out. We asked this question because we want to help you be a more effective parent with real life, day-to-day struggles. There were three parenting styles that readers consistently told us they were using and weren’t working the way they would like. The common denominator? All three undermine your authority as a parent. Just as it’s not effective to negotiate your rules or yell, it’s not effective to soften your rules or expectations because your child says they’re too hard . Remember, while there is no right or wrong way to parent, there are effective ways and ineffective ways. The good news is that you always have the chance to do things just a little differently. As Janet Lehman tells us, you can change your parenting style at any time in your journey with your child, whether they are 2 or 22. Here are the three ineffective styles you told us about, along with alternative, more effective solutions. It’s so tempting, isn’t it, to yell at your child—especially when they’re yelling. Sometimes you feel like you have to raise your voice just to be heard at all, let alone have your child do what you want them to do. But yelling doesn’t work. As James Lehman writes in The Total Transformation Program, yelling lets your child know that you are not in control. When you join your child in yelling, you’re showing them that in that moment you are their peer, not their parent. The interaction quickly becomes about your yelling instead of their behavior. And when you feel the need to defend your yelling, it takes even more of the focus off your child’s behavior. Yelling does not give you authority. It actually undermines it. When you maintain your own temper, you are claiming your authority as a parent. I’m not saying this is easy, at least not at first. Everyone yells sometimes. You’re human. Keep practicing, and keep bringing the focus back to your child’s behavior and the changes they need to make, and you’ll find it does get easier. It seems like many kids are born lawyers. They look for any possible loophole, any flaw in your rules, or in how you deliver those rules. And what parent enjoys giving consequences or saying no? We want our kids to be happy. Conflict is hard. If you yelled at your child and then feel guilty, it’s tempting to be overly lenient to make up for it. Making it even harder, when kids know that sometimes the rules can be changed, they will always try negotiating, hoping that this is “one of those times.” They know that if they’ve previously talked you into changing the rules (“Just this once!”), or gotten you to agree to a lesser consequence (“But I can’t come home right after school because…”), it can always happen again. Because when you change a rule or a consequence, you are telling your child that rules can always be broken and that limits are meaningless. I mean, why would anyone follow rules that can be negotiated away? Kids(and adults!) will always argue when they think there’s a chance they’ll get their way. The solution? Consistency. If you want your child to change his behavior, your consequences need to be clear and consistent. Consistency lets kids know that negotiation is not an option. Of course, sometimes kids have some good points. And sometimes they just need to vent about what they see as a grave injustice. Okay. That’s true for everyone; sometimes we just need to voice our opinion. James Lehman has a great solution for this: complaint time. Rather than allow your child to complain and attempt to negotiate different rules or consequences, set up a daily or weekly complaint time. During this time, listen to their grievances; you can even discuss some options for the future. But remain clear that this is not a place to plead their case. Rules will not change and consequence given will remain in place. This is simply a designated time for their concerns to be heard. What does it mean to “rescue” your child? As parents, we hate to see our children struggle. When we see our child getting frustrated, we want to make it easier; and so we lower our expectations, or take over the task our child is wrestling with. The tricky thing is, kids don’t grow and change without struggle. Doing something new can be hard; but children won’t learn more effective ways to deal with their problems if they don’t struggle. If you jump in and rescue your child, you’re doing two things. One, you’re training them to give up when things get hard. If all they have to do is say “I can’t,” and you do it for them, why should they push through and try? Two, by jumping in at the first sign of difficulty, you’re actually sending your child the message that you don’t believe they can do it. If you want to see your child learn new skills and change their behavior, you have to develop your tolerance for seeing them struggle as they learn. I don’t mean you should refuse to help if they need it! But this is when you need to be a coach for your child, like James teaches us. You are not there to do it for them; you are there to guide them through learning the behaviors they’ll need to be healthy, well-adjusted people. One big way you coach and guide your child is by establishing—and sticking to—clear rules, expectations, and consequences. Just as it’s not effective to negotiate your rules or yell, it’s not effective to soften your rules or expectations because your child says they’re too hard. Of course, this can get tricky if your child acts out when they feel overwhelmed. 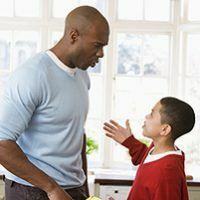 Sometimes parents make things easier for their child as a way to protect themselves and others from their child’s destructive behaviors: if you never challenge the child, then you never have to deal with the full-blown melt-down or aggressive response. The truth is, while this approach might seem effective in the short-term, it won’t accomplish your goal of helping your child learn how to regulate their behavior, especially when they feel stressed. If you keep your child’s environment unnaturally calm, they will never learn to deal with pressure effectively. It is far more effective to teach your child to handle their problems than it is to convince the rest of the world to tread lightly around your child.